Hi, this is Cathy; I'm guest-blogging on Tom's page, and he's playing editor this time! We recently needed to drive approximately 80 miles (one way) to get to clearer skies for viewing the Venus transit. That provided a great opportunity to try out DC quick charging (DCQC) with our LEAF. We charged up to full in Bellevue using Level 2 charging, drove to the Tumwater DCQC station, charged back to full while we watched the transit, and returned home to Sammamish. We have one of Gary Gidding's SOC Meters. It shows a state-of-charge (SOC) percent, which it calculates from a raw energy unit reported on the car's CAN bus. The meter can be set to show the raw energy unit, which the LEAF community has dubbed a "gid." It is reasonably well established that a gid represents 80 watt-hours (Wh). Gids are divided by 281 to approximate an SOC %. Note that the pack kWh is not something that can be directly measured. The car determines this value through sophisticated measurements and calculations, which result in periodic adjustments that are seen as "jumps" in the gids. We arrived in Tumwater with 2 bars, or more precisely 61 gids, which translates to 4.88 kWh, or 21.7%. Since we were under 50%, our (first) DC quick charge brought us to 80%. The car charged for approximately 26:40 minutes, at which point it was showing 226 gids (18.08 kWh, 80.4%). The station reported having provided 14.36 kWh, and the car showed a net gain of 13.20 kWh. The SOC % axis is scaled to correspond to kWh values (both graphs). It is interesting to note that the SOC % reported by the station (gold dots) does not match the SOC % of the car. We are not sure what causes this discrepancy, but we've seen this consistently in subsequent DCQC sessions. We expected to need more than 80% charge to make it home, and we wanted to see how to handle getting a full charge after arriving at a station under 50%. So, after the first charging session stopped at the expected 80%, we unplugged and returned the connector to the station. Then we initiated another charging session. Our second DCQC charge took 36:35 minutes, increasing the car's charge to 266 gids (21.28 kWh, 94.7%). The station supplied 3.609 kWh and the car's charge increased by 3.2 kWh. At the end of the second charge, the battery temperature was registering 6 bars. Ambient temperature was 61° F.
We have monitored gids and miles driven over several recent drives. For freeway and combined freeway / surface-street driving we see typical energy use in the range of 250 to 280 Wh/mi, with extreme readings as low as 230 or as high as 290. The image on the left is after we had driven 74 miles from Tumwater to Issaquah. Stopping for dinner won out over completing the drive home and growing more trees. Details on a few legs of the trip from Bellevue to Tumwater. The bars are based on an approximation of the percentage of the maximum available energy. This maximum varies with temperature as well as with battery age as capacity is reduced. Don't forget that there is some amount at the bottom (2%?) that is unavailable; the car will shut down before letting you deplete the battery that far. Warning message ("Battery level is low") on the dot matrix liquid crystal display just above the steering wheel. Illumination of the low battery charge warning light (the icon showing a pump with a plug). Flashing driving range (affectionately known in the LEAF community as the Guess-O-Meter). We arrived home with 35 gids remaining and did not see the turtle. Continue reading Planning a Road Trip Using DC Quick Charging. On Monday, the weather was too nice to not be out driving so I decided to take a spin up to Mt. 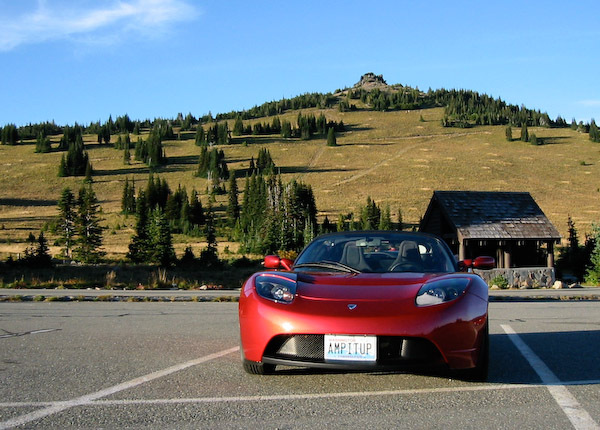 Rainier to see if the roundtrip could be done on a single charge. Thanks to Todd Laney for planting the seed by suggesting it as a possible Roadster owner drive route to follow our adventure on Sunday. I used Google maps to plot a route and get mileage/time estimates. Google estimated the drive at about 2:30 and my goal was to make the roundtrip in four hours. On the way back I took Highway 18 instead of Cedar Grove Rd SE, which wasn't that scenic and smelled of landfill. I left our house at 4:00 pm, with a full standard mode charge at 194 ideal miles. I reset the trip meter so I could easily track mileage and energy used. I left later than I had hoped, and I paid for it by being stuck in traffic pretty much the entire way from Issaquah to Enumclaw. That didn't help with my four-hour goal. Give or take a few stunning views of Rainier near Black Diamond, the drive didn't get fun until I left Enumclaw (and the traffic) and got onto SR 410, a two-lane road through forest. I was pushing to make up lost time, but mindful of the risk of deer crossing the road, so I kept the speedometer at or a little above the speed limit. I didn't see much traffic and only passed one vehicle, a van going well below the speed limit. I neglected to record state when I entered the park to begin the ascent up the mountain, but I recall the battery being around 90 ideal miles and the trip odometer would have been around 70. At about 4 miles from Sunrise, the trip and battery state crossed at 79 miles driven and 79 ideal miles left in the battery pack. If I were on level ground, I would have been considering bailing at that point, but I knew I had used extra energy climbing that I would get back on the descent. Also, I was still driving in standard mode, so I could switch into range mode to get another 25 miles of range. The best part of the drive was the winding ascent up the mountain, wonderful conditions for the Roadster, although the road was pretty uneven in spots. I was having fun but not being crazy about it. Two thirds of the way up the mountain, I came up behind another car and resigned myself to taking the rest of the drive at his pace, which would have been fine. However, as soon as I came up behind him, he immediately pulled over to let me pass. I don't know whether he was scared of the red sports car, or just really nice. I waved in appreciation as I passed. I arrived at Sunrise at 6:08 pm, just a few minutes later than my goal time. I let the car sit for a few minutes while I tracked down a restroom and snapped a quick photo. Ready for the return drive, the trip meter said I had driven 83.7 miles and used 28.01 kWh. The touchscreen altimeter said 6300 ft, temperature at 60 F, with the SOC at 47% and 69 ideal miles (standard mode). For the descent, I got regen nearly the entire way. I stopped twice on the way down, once at the viewpoint just below Sunrise where I got my cell phone signal back and called to update Cathy on my progress, and at the bottom to record data. At the park exit, 14.0 miles from Sunrise, the battery state was up to 71 ideal miles, a net gain of two ideal miles from the reading at the top. I was treated to a beautiful sunset with a thin crescent moon just above the horizon as I was finishing up the drive on SR 410 approaching Enumclaw. I had a TomTom GPS navigation device programmed for the route home, mostly to show me remaining miles and ETA. When I left the summit at 6:20 or so, it was predicting I would get home just before 9:00, which was obviously wrong since I made the trip there in just over two hours. After exiting the park, the ideal miles tracked the remaining miles pretty closely, showing a buffer of about 10 miles the entire way, while the ETA dropped steadily. I got home at 8:20, missing my four-hour goal by about the length of my stops. The trip meter read 168.8 miles and 41.76 kWh. Our house is about 100 ft elevation, so the trip involved climbing then descending 6,200 feet. The battery pack was showing a temperature reading of four (the highest of the blue ticks), PEM and motor at 3. After sitting for 20 minutes to stabilize, the state of charge read about 5% of the battery left, 9 ideal miles. Charging back up to full (standard mode) from 240V/40A took 5:20 and put 44 kWh back into the battery pack. The meter on the wall indicated it pulled 50.0 kWh hours, or 296 Wh/mi from wall to wheel, about 12% below my average of 336 Wh/mi. If Watt-hours per mile doesn't mean anything to you, at 9 cents per kWh for "green power" from Puget Sound Energy, it cost me about $4.50 to drive 168.8 miles, or about 37.5 miles per dollar of green electricity. The roundtrip can be done on a single standard mode charge, but if you have a passenger or are farther away than Sammamish, I'd recommend a range mode charge. If you do it on a weekday, start early enough to avoid the evening rush hour. Take a credit card: it costs $15 to get into the park via the automated kiosk. Cash might also work. Driving through the woods at sunset on a warm day leaves the front of your car covered with a thick layer of bugs. Updated July 12, 2011: Fixed link to route map.